CHIMANIMANI, Zimbabwe — A week after Cyclone Idai lashed southern Africa, flooding still raged Thursday as torrential rains caused a dam to overflow in Zimbabwe, threatening riverside populations. 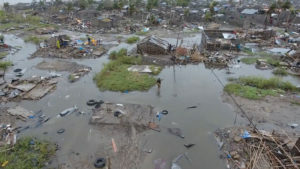 The confirmed death toll in Zimbabwe, neighboring Mozambique and Malawi surpassed 500, with hundreds more feared dead in towns and villages that were completely submerged. WFP said Malawi’s government had reported more than 920,000 people in the country were affected by the floods. The agency said Idai had had a “limited impact” on Malawi, and projected that the number of affected people will decline as they return home. Associated Press writer Andrew Meldrum in Johannesburg and Jamey Keaten in Geneva contributed to this report.